More info:Plus local payment from USD 800. 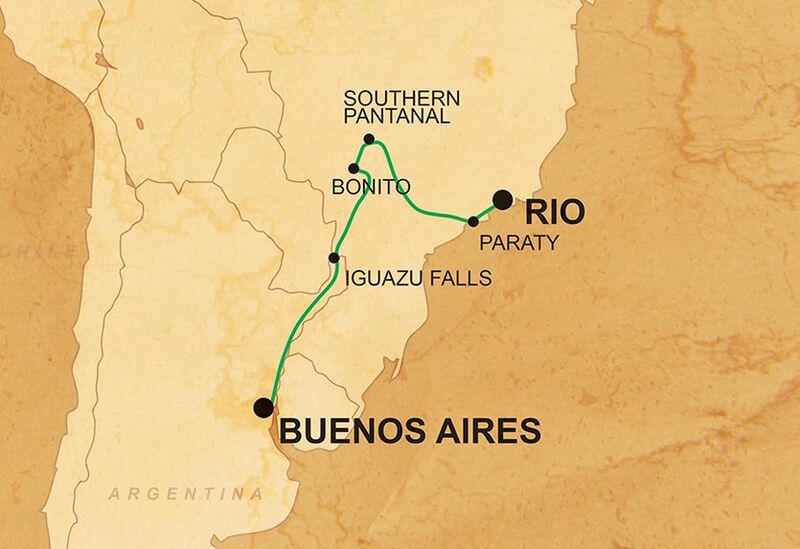 On this epic trip through Argentina and Brazil, we will be traveling overland, using a combination of overland vehicles, boats, and 4x4s, thus cutting out the need for air travel and reducing carbon-emissions. Going overland (by car and on foot for excursions) means you get to experience physically crossing the borders between countries as well as explore places which are off the beaten track. We have a strict set of rules regarding wildlife-spotting, for example when in the Pantanal. In order to minimise the impact of our presence on the wildlife and ecosystem of the areas where we travel, we explicitly forbid any involvement in activities that harm or exploit animals, and advise our crew in specific activities to avoid in this regard. In the Pantanal we stay at a Fazenda that is dedicated to scientific research, and wildlife monitoring and conservation projects, and is the home of the Wild Animal Rehabilitation Centre, supporting the rehabilitation and re-introduction of wild animals that were rescued from illegal trade. We use local guides and operators throughout the trip; for example, in the Pantanal we use a responsible local operator that provides training and employment to many local people as guides, providing them with stable employment in the tourism industry. We are also involved with a variety of community projects in key destinations as we visit. Our involvement with these projects is a long-term commitment, allowing us and our passengers to participate directly in delivering real practical benefits to the communities we travel through on the ground. The projects are not tourist initiatives, but a way of employing tourism to generate funding and support and facilitate community interaction. For example, in Rio de Janeiro we have the opportunity to visit and support the Morrinho Project, a social and cultural project in the Vila Pereira da Silva favela based on a model of Rio de Janeiro built since 1998 by teenagers looking for escapism from the violence and corruption surrounding their community.